Cytoplasmic FMR1-interacting protein 2 (CYFIP2) is a key component of the WAVE regulatory complex (WRC) which regulates actin polymerization and branching in diverse cellular compartments. Recent whole exome sequencing studies identified de novo hotspot variants in CYFIP2 from patients with early-onset epileptic encephalopathy and microcephaly, suggesting that CYFIP2 may have some functions in embryonic brain development. 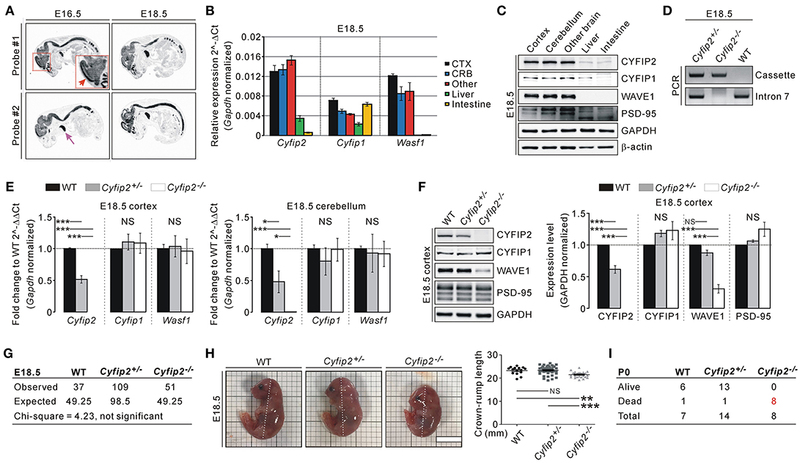 Although perinatal lethality of Cyfip2-null (Cyfip2−/−) mice was reported, the exact developmental time point and cause of lethality, and whether Cyfip2−/− embryonic mice have brain abnormalities remain unknown. We found that endogenous Cyfip2 is mainly expressed in the brain, spinal cord, and thymus of mice at late embryonic stages. Cyfip2−/− embryos did not show lethality at embryonic day 18.5 (E18.5), but their body size was smaller than that of wild-type (WT) or Cyfip2+/− littermates. Meanwhile, at postnatal day 0, all identified Cyfip2−/− mice were found dead, suggesting early postnatal lethality of the mice. Nevertheless, the brain size and cortical cytoarchitecture were comparable among WT, Cyfip2+/−, and Cyfip2−/− mice at E18.5. Using RNA-sequencing analyses, we identified 98 and 72 differentially expressed genes (DEGs) from the E18.5 cortex of Cyfip2+/− and Cyfip2−/− mice, respectively. Further bioinformatic analyses suggested that extracellular matrix (ECM)-related gene expression changes in Cyfip2−/− embryonic cortex. Together, our results suggest that CYFIP2 is critical for embryonic body growth and for early postnatal survival, and that loss of its expression leads to ECM-related gene expression changes in the embryonic cortex without severe gross morphological defects. The Cytoplasmic FMR1-interacting protein (CYFIP1 and CYFIP2) family is a critical component of the heteropentameric WAVE regulatory complex (WRC) which regulates actin polymerization and branching in diverse cellular compartments (Abekhoukh and Bardoni, 2014; Lee et al., 2017). Despite their high sequence homology at the protein level (88% identity and 95% similarity) (Schenck et al., 2001), several lines of evidence indicate that CYFIP1 and CYFIP2 have distinct and non-complementable functions in vivo (Cioni et al., 2018). For example, both Cyfip1- and Cyfip2-null mice are lethal at different developmental stages. Specifically, Cyfip1-null (Cyfip1−/−) embryos die before embryonic day 9.5 (E9.5) (Chung et al., 2015). In the case of Cyfip2−/− mice, perinatal lethality was reported (Kumar et al., 2013; Han et al., 2015), but the exact developmental time point and cause of lethality, and whether Cyfip2−/− embryos have molecular or morphological brain abnormality remain unknown. Clinically, variants of CYFIP1 have been associated with neurodevelopmental and neuropsychiatric disorders, including autism spectrum disorders, intellectual disability, and schizophrenia (Abekhoukh and Bardoni, 2014). Although the genetic associations between CYFIP2 and brain disorders are relatively unknown, two recent whole exome sequencing studies identified de novo hotspot variants of CYFIP2 (at the Arg87 residue) in patients diagnosed with West syndrome (Nakashima et al., 2018; Peng et al., 2018). The variants may disrupt the inhibitory interaction between CYFIP2 and WAVE in the WRC, leading to aberrant activation of the WRC and downstream actin polymerization (i.e., gain-of-function effects on the WRC) (Nakashima et al., 2018). The West syndrome is characterized by early-onset epileptic encephalopathy and developmental delay, and the symptoms typically start between three and twelve months of age (D'alonzo et al., 2018). The patients with CYFIP2 variants showed signs of microcephaly and began experiencing seizures around three to six months of age (Nakashima et al., 2018). Therefore, it is conceivable that CYFIP2 may have some roles in embryonic brain development. To examine the function of CYFIP2, we characterized expression patterns of endogenous Cyfip2 mRNAs and proteins in embryonic mice. We then compared the survival rate, body and brain size, and cortical cytoarchitecture of Cyfip2−/− embryonic mice with those of wild-type (WT) or Cyfip2+/− littermates. We also performed transcriptomic analyses in the cortex of Cyfip2+/− and Cyfip2−/− embryonic mice. The results suggest that CYFIP2 is critical for embryonic body growth and for early postnatal survival, but loss of its expression does not cause severe defects either in embryonic brain size and cortical cytoarchitecture. However, at the molecular level, expression of extracellular matrix (ECM)-related genes is altered in the cortex of Cyfip2−/− embryonic mice. More information about materials and methods is provided in Supplementary Materials. The Cyfip2-mutant mice used in this study have been described previously (Han et al., 2015). The WT and Cyfip2 mice were bred and maintained on a C57BL/6J background, and all mice used in experiments were obtained by heterozygous mating (Cyfip2+/− X Cyfip2+/−) according to the Korea University College of Medicine Research Requirements. All procedures were approved by the Committees on Animal Research at Korea University College of Medicine (KOREA-2016-0066). The mice were fed ad libitum and housed under a 12 h light-dark cycle. To understand the expression pattern of endogenous Cyfip2 in embryonic mice, we performed in situ hybridization analysis with two independent probes against Cyfip2 transcripts. In E16.5 and E18.5 WT mice, Cyfip2 transcripts were detected throughout the central nervous system, and relatively strong signals were observed in the cortex (Figure 1A). Intriguingly, strong Cyfip2 expression was also detected in the thymus but not in other organs. Consistent with the in situ hybridization analysis, qRT-PCR analysis showed that Cyfip2 and Wasf1 (encoding WAVE1) transcripts were more abundant in the brain compared with the liver and intestine of E18.5 mice (Figure 1B). Meanwhile, Cyfip1 transcripts in the intestine were as abundant as those in the brain. At the protein level, CYFIP1, CYFIP2, and WAVE1 were expressed in the E18.5 brain at levels higher than those in the liver and intestine (Figure 1C). We observed similar results from tissue samples of postnatal day 0 (P0) mice (Figure S1). Figure 1. Smaller body size and early postnatal lethality of Cyfip2−/− embryonic mice. (A) in situ hybridization analysis of Cyfip2 in E16.5 and E18.5 WT mice. The red and purple arrows indicate the cortical region and thymus, respectively. (B) qRT-PCR analysis of Cyfip1, Cyfip2, and Wasf1 mRNAs in tissue samples from E18.5 WT mice. CTX, cortex; CRB, cerebellum; Other, other brain regions. (C) Western blot analysis of CYFIP1, CYFIP2, and WAVE1 proteins in tissue samples from E18.5 WT mice. (D) Genotyping PCR results of E18.5 WT, Cyfip2+/−, and Cyfip2−/− mice. (E) qRT-PCR analysis of Cyfip1, Cyfip2, and Wasf1 mRNAs in the cortex (left panel) and cerebellum (right panel) of E18.5 WT, Cyfip2+/−, and Cyfip2−/− mice (n = 4 mice per genotype). NS, not significant. (F) Western blot analysis of CYFIP1, CYFIP2, and WAVE1 proteins in the cortex of E18.5 WT, Cyfip2+/−, and Cyfip2−/− mice (n = 4). A synaptic protein PSD-95 was blotted as a control. (G) The numbers of observed WT, Cyfip2+/−, and Cyfip2−/− mice at E18.5. They are not statistically different from the numbers expected from Mendelian ratios, based on the Chi-square test. (H) Representative images and quantifications show smaller body size (crown-rump length, dotted line) of E18.5 Cyfip2−/− mice compared with WT and Cyfip2+/− littermates (n = 15, 44, 26 for WT, Cyfip2+/−, and Cyfip2−/− mice, respectively). Scale bar, 1 cm. (I) The numbers of observed alive or dead WT, Cyfip2+/−, and Cyfip2−/− mice at P0. By using two primer sets (one for the targeting cassette of Cyfip2-mutant mice, and the other for intron 7 of Cyfip2), we could identify WT, Cyfip2+/−, and Cyfip2−/− mice at E18.5 (Figure 1D). We could confirm that Cyfip2 mRNAs and proteins in the cortex and cerebellum were reduced by approximately 50% in Cyfip2+/− mice compared with WT mice, and not detected in Cyfip2−/− mice at E18.5 (Figures 1E,F). There was no change in Cyfip1 and Wasf1 mRNA levels in either Cyfip2+/− or Cyfip2−/− embryonic mice compared with WT littermates (Figure 1E). However, at the protein level, WAVE1, but not CYFIP1, was reduced in Cyfip2−/− cortex at E18.5 (Figure 1F), which is consistent with previous reports showing decreased WAVE1 protein stability without CYFIP (Zhao et al., 2013; Han et al., 2015). Next, we counted the numbers of WT, Cyfip2+/−, and Cyfip2−/− mice at E18.5 to understand whether Cyfip2−/− mice show prenatal lethality. However, from the total number of 197 mice counted, the numbers of WT, Cyfip2+/−, and Cyfip2−/− embryos were not statistically different from the numbers expected from Mendelian inheritance ratios (Figure 1G). Nevertheless, when we measured crown-rump length of the embryos, we could find that Cyfip2−/− mice were significantly smaller than WT and Cyfip2+/− littermates at E18.5 (92.4% of WT, and 91.8% of Cyfip2+/−) (Figure 1H). In contrast, body weights were comparable among WT, Cyfip2+/−, and Cyfip2−/− mice at E18.5 (Figure S2), suggesting that smaller size of Cyfip2−/− mice was likely due to their defects in body curvature. We also counted the numbers of WT, Cyfip2+/−, and Cyfip2−/− mice at P0. During the counting, we often observed dead pups in the cages. Indeed, after genotyping PCR, we found that all identified Cyfip2−/− mice were dead at P0 (Figure 1I). The smaller body size and early postnatal lethality of Cyfip2−/− embryos prompted us to investigate brain abnormalities of the mice. However, brain size, as measured by width and length of the cortical region, was comparable among WT, Cyfip2+/−, and Cyfip2−/− mice at E18.5 (Figure 2A). Moreover, DAPI staining of the brain sections showed generally normal morphology of Cyfip2−/− brains at E18.5 (Figure 2B). To further analyze the details of the cortical cytoarchitecture of the embryos, we performed fluorescent immunohistochemistry on the cortical area using antibodies against Brain-2 (Brn2, marker for layers 2/3, and 5) and COUP-TF-interacting protein 2 (Ctip2, marker for layer 5/6) (Figure 2C). We found that total width of the cortex (from layer 2/3 to intermediate zone), and relative width of each layer to total width (percentage of total width) were similar among WT, Cyfip2+/−, and Cyfip2−/− mice at E18.5 (Figure 2D). We further confirmed these results with additional antibodies against Cut like homeobox 1 (Cux1, marker for layer 2/3) and T-box brain protein 1 (Tbr1, marker for layer 6) (Figure S3). However, the relative width of layers 2-4 to the total width was significantly larger in Cyfip2−/− embryos than in the Cyfip2+/− littermates. We also examined F-actin levels in the cortex, but they were not different among WT, Cyfip2+/−, and Cyfip2−/− embryos. Furthermore, the total neurite lengths of WT and Cyfip2−/− cultured cortical neurons (at days in vitro 4) were comparable, but those between Cyfip2+/− and Cyfip2−/− neurons were slightly, but significantly different (Figure S4). Figure 2. Normal brain morphology, but cortical ECM-related gene expression changes of Cyfip2−/− embryonic mice. (A) Representative images and quantifications show normal brain size of E18.5 Cyfip2−/− mice compared with WT and Cyfip2+/− littermates (n = 12, 31, 20 for WT, Cyfip2+/−, and Cyfip2−/− mice, respectively). NS, not significant. Scale bar, 3 mm. (B) Schematic diagrams show the regions of interests (ROIs) for immunohistochemistry analysis (left panel). Representative images of DAPI staining show that overall brain morphologies are comparable among E18.5 WT, Cyfip2+/−, and Cyfip2−/− mice (right panel). A, anterior; P, posterior. (C) Representative images of Brn2, Ctip2, F-actin, and DAPI staining in E18.5 WT, Cyfip2+/−, and Cyfip2−/− cortex (the ROI is depicted in (B), red box). IZ, intermediate zone. (D) Quantifications of the cortical cytoarchitecture in E18.5 WT, Cyfip2+/−, and Cyfip2−/− mice (n = 12 sections from 6 WT, 14 sections from 7 Cyfip2+/−, and 11 sections from 6 Cyfip2−/− mice). (E) Volcano plots for the cortical RNA-seq analyses of Cyfip2+/− (left panel) and Cyfip2−/− (right panel) mice, respectively. DEGs, defined by FDR < 0.05, are shown as orange (FC = < 1.5) and red (FC > 1.5) circles. FC, fold change. (F) GO and KEGG pathway analyses of the DEGs of the Cyfip2−/− embryonic cortex. (G) The bar graph shows normalized enrichment scores of GSEA on the KEGG gene sets for the cortical RNA-seq analysis of Cyfip2−/− embryonic mice. The enrichment plot of cortical RNA-seq analysis of Cyfip2−/− embryonic mice on the “ECM receptor interaction” gene set (lower panel). Next, we performed transcriptomic analyses (RNA-sequencing [RNA-seq]) of cortical tissue from E18.5 WT, Cyfip2+/−, and Cyfip2−/− mice, to identify any molecular changes (Table S1). After applying adjusted P values to the analyses, we identified 98 and 72 differentially expressed genes (DEGs) in the Cyfip2+/− and Cyfip2−/− cortex, respectively, compared with the WT cortex (Figure 2E and Tables S2, S3). Gene ontology (GO) and Kyoto Encyclopedia of Genes and Genomes (KEGG) pathway analyses of the 98 DEGs in the Cyfip2+/− cortex showed no significant term in any category, possibly because of heterogeneity of the DEGs. However, same analyses on the 72 DEGs in the Cyfip2−/− cortex revealed extracellular matrix (ECM)-related terms to be significant (Figure 2F and Table S4). Furthermore, Gene Set Enrichment Analysis (GSEA), which is used to identify molecular signatures based on the broader expression changes in the transcriptome, also suggested “ECM receptor interaction” as a significantly enriched term especially from the up-regulated genes in the Cyfip2−/− cortex (Figure 2G and Table S5). Taken together, our results suggest that CYFIP2 is critical for embryonic body growth and for early postnatal survival. CYFIP2 is not essential for overall embryonic brain development, in terms of gross morphology, as assessed by brain size and cortical cytoarchitecture of Cyfip2−/− mice. 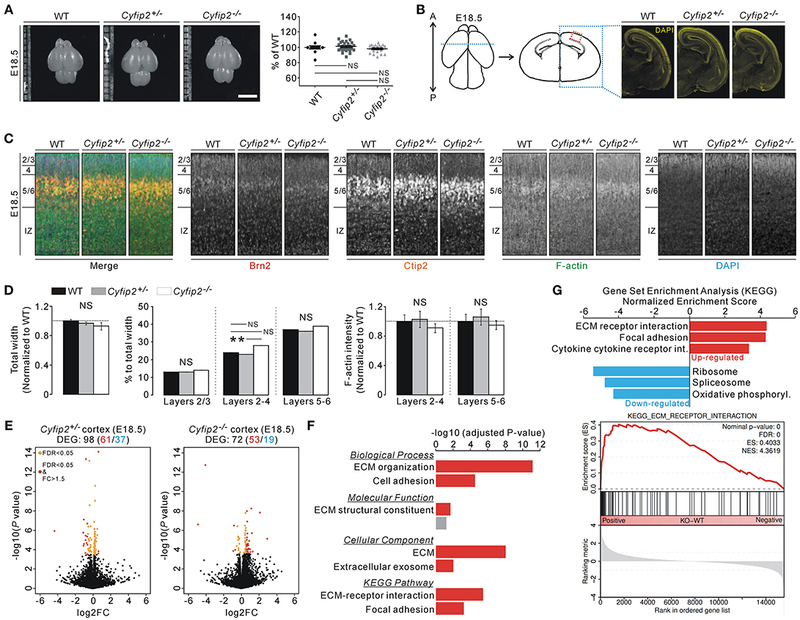 However, at the molecular level, ECM-related genes are significantly altered in the cortex of Cyfip2−/− embryonic mice. ECM affects many aspects of brain development, ranging from neuronal migration to synapse formation (Barros et al., 2011). Therefore, further detailed analyses about the cortical ECM in Cyfip2−/− mice may potentially provide better insight toward understanding the functions of CYFIP2 in embryonic mice. However, our results may not be directly implicated in the pathophysiology that underlies early-onset epileptic encephalopathy and developmental delay associated with West syndrome, because the CYFIP2 variants found in patients have gain-of-function effects on the WRC and do not affect CYFIP2 stability (Nakashima et al., 2018). YZ, YL, YK, BL, JK, CJ, SK and KH designed and performed the experiments. HKa, HKi, and KH analyzed and interpreted the data. HKa and KH wrote the paper. All authors read and approved the manuscript. This work was supported by a National Research Foundation of Korea (NRF) grant funded by the Korea government Ministry of Science and ICT (NRF-2018R1C1B6001235), by the Brain Research Program through the NRF funded by the Korea government Ministry of Science and ICT (NRF-2018M3C7A1024603), by a grant of the Korea Health Technology R&D Project through the Korea Health Industry Development Institute (KHIDI) funded by the Ministry of Health & Welfare (HI16C0090), by a Korea University grant (K1721411), and by the Korea Institute of Science and Technology Information (K-18-L12-C08-S01). Copyright © 2019 Zhang, Kang, Lee, Kim, Lee, Kim, Jin, Kim, Kim and Han. This is an open-access article distributed under the terms of the Creative Commons Attribution License (CC BY). The use, distribution or reproduction in other forums is permitted, provided the original author(s) and the copyright owner(s) are credited and that the original publication in this journal is cited, in accordance with accepted academic practice. No use, distribution or reproduction is permitted which does not comply with these terms.